We have all encountered an embarrassment of riches at some point in our lives. Perhaps it was when we were at a party with a buffet table crowded with too many tasty dishes or when we were visiting a city in which too many historic churches had to be seen. My most recent embarrassment of riches came in late August during a car trip from Birch Bay, WA to Mendocino, CA. Traveling down the coast, I encountered so much natural scenic beauty, so many memorable vistas, that I was unable to do more than sample a few of them. 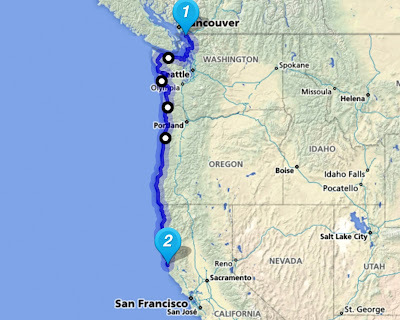 The idea of the trip was to see as much of the coasts of Washington, Oregon, and Northern California as possible. After getting to the Olympic Peninsula, much of the drive was on Hwy 101. In Washington, it sometimes veered inland, and we had to take some smaller highways to get closer to the water. In contrast, much of Oregon’s Coastal Highway (also Hwy 101) lies within view the Pacific, so side trips were not necessary. In California, after enjoying stops in the Redwood National Forest, accessing the coast required leaving Hwy 101 and driving a perilous mountain route on Hwy 1 to reach the coast. From there, Hwy 1 was often near the edge of the buffs overlooking the ocean. The trip was made with my young friend Denis Gajdamaschko. We have traveled together to many places since he turned twelve, including Austria, Poland, Ukraine, and China, plus we have shared a car on long drives from Athens (GA) to Fayetteville (AR) and Athens to Birch Bay (WA). He was as eager as I to see the Pacific Northwest coastline. We departed from Birch Bay, WA (about 9 miles from the Canadian border) to drive to one of my favorite little towns, Coupeville, on Whidbey Island. 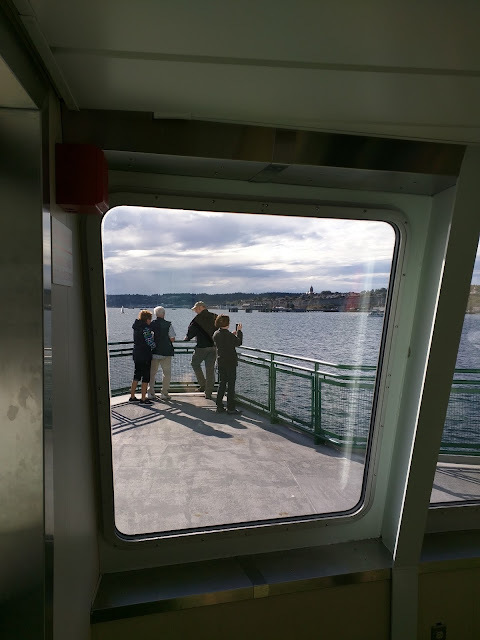 There, we caught a ferry to Port Townsend which is located on the north shore of the Olympic Peninsula. The ferry ride is a short one, covering the 17 or so miles in less than 30 minutes. The city of Port Townsend has an historic waterfront built on a bluff overlooking the Strait of Juan de Fuca and is worth an extended visit, but we stopped only to look at the housing models set up by Greenpods ( http://www.greenpoddevelopment.com/ ). This firm designs and builds efficient and modernistic modular housing, a candidate to occupy a lot I co-own in Birch Bay. We were impressed with both the design and quality of the model units we saw. 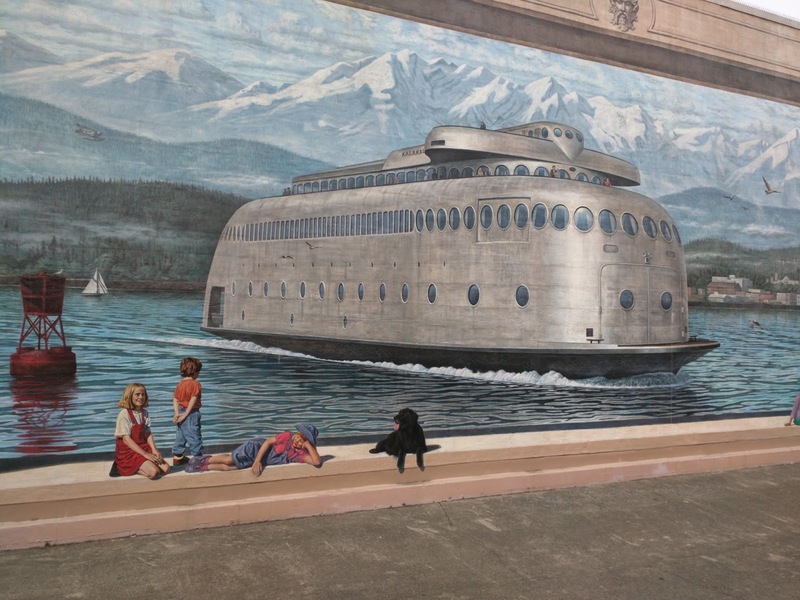 After that brief stop, we headed west to Port Angeles, another old seaport, to spend the night (http://www.portangeles.org/pages/ActivitiesAttractions/link ). This coastal city with nearly 20,000 residents lies on the north end of the Olympic Peninsula in the shadows of the Olympic Mountains. From Port Angeles’ ferry landing, the city of Victoria (Canada) is only about 25 miles across the Strait (https://www.cohoferry.com/ ) The city has mellow, artistic undertones amid the bulk and debris of an aging seaport. The next day, we took off on Hwy 101 for the real adventure. The road plunged quickly into the Olympic National Park; although the highway generally follows the coastline, it often lies several miles away from the ocean. To get to the ocean beaches, we exited it at a couple of points to go farther west. Not far from Port Angeles, we turned west onto Highway 112 near Sappho, WA. 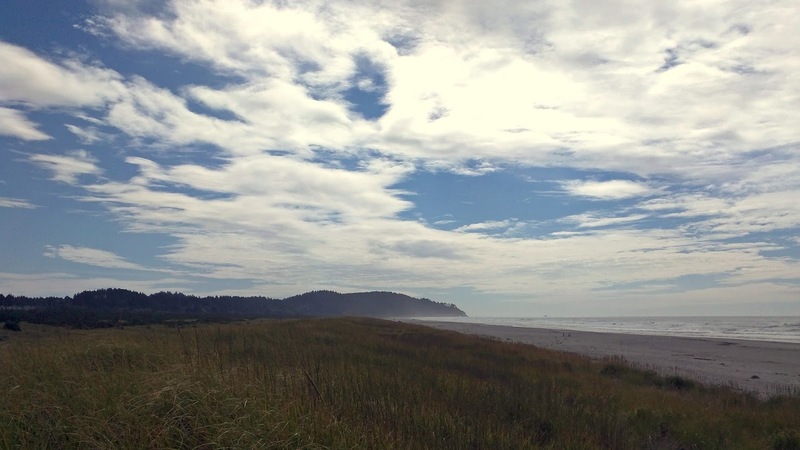 After a short ride, we checked out Clallam Bay, a small but robust town with an expansive and empty sandy beach. After enjoying the beach views and reading about the town’s naval history on historical monuments in the city park, we headed back to Hwy 101, ready to exchange bay views for some raw ocean. In and near La Push, we made our way to three sandy beaches (cleverly named First Beach, Second Beach, and Third Beach) separated by bluffs and rock formations. All three were under attack by enormous Pacific waves. To get to two of the beaches, we had to walk steep narrow trails, but the efforts were rewarded with the feel of white sand under our feet, the sound of the raucous ocean, and the sight of the sun turning the water a deep blue with white fringes. La Push is surrounded by the Olympic National Park, which includes coastal long the northern part of the Olympic Peninsula. As with all Indian Reservations on the Peninsula, the Quileate reservation is not part of the park. The drive down Highway 109 mostly followed the shoreline, taking us past several small, aging cities with coastal resorts and RV parks. However, just a few miles south of Moclips, which is populated by modest houses offering million dollar views, we passed through Seabrook, a new development with expensive modern houses overlooking the ocean (http://www.seabrookwa.com/ ). We puttered down Hwy 109 until we got to Hwy 115, which goes down a peninsula that ends at Ocean Shores, a small rectangular town, six miles long and two miles wide. Surrounded by water on three side, the ocean side of this resort town has huge sandy beaches onto which some people drive their cars. Although this was the first place where we saw cars on the beach, it turned out to be commonplace on Washington beaches further south. 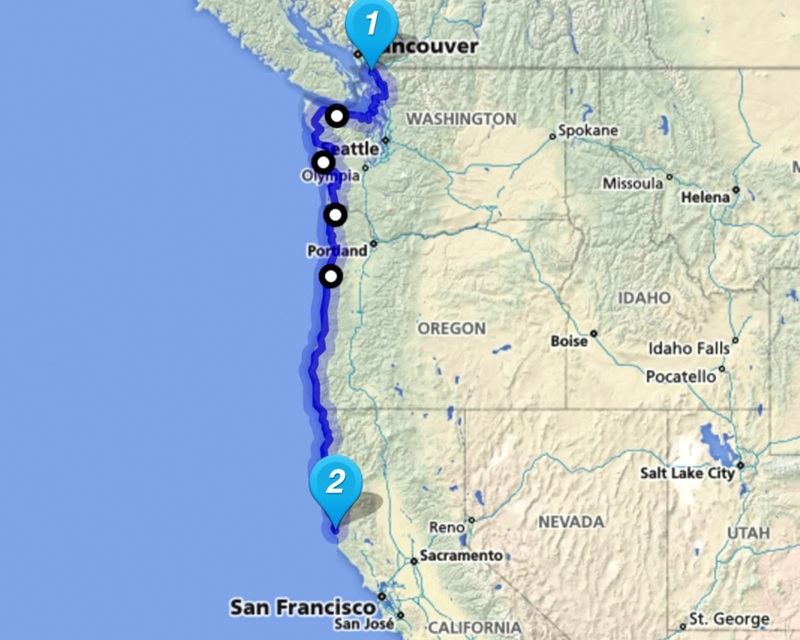 Ocean Shores, with a population of about 5,600, is laid out on a precise grid. This precision likely came during its initial development as a resort in the 1960s. In its initial incarnation, the city, as developed by the Ocean Shores Development Association, was a glitzy place for the rich and famous. Why else would Pat Boone live there for a while? See https://en.wikipedia.org/wiki/Ocean_Shores,_WashingtonWikipedia . The city’s low-lying, sandy soil, reminds me of similar cities along the coasts of the Carolinas and Georgia. It has several hotels/motels for tourists attracted by its moderate climate and superlative beaches. (For the city’s attractions, see: http://www.tourismoceanshores.com/ and http://oceanshores.com/ .) Also, most noticeable, it has an astonishing number of deer roaming along the roads, munching grass along the public land and in the yards of the city’s residents. Who needs a speed limit when the threat of hitting a deer is always looming? After a night in Ocean Shores, we drove on Hwy 109 to Hoquiam and Aberdeen where many of the innumerable logging trucks on Hwy 101 dump their loads. Back on Hwy 101, we drove several miles away from the Ocean until we made it to Raymond, which looked like another logging town. After Raymond, Hwy 101 again ran along or near the Ocean for many miles, providing several different opportunities to stop and check out the seemingly unending sandy beaches. We pulled off Hwy 101 to visit the Long Beach peninsula. Long Beach claims it has the “World’s Longest Beach,” and its white sand does stretch about eleven miles from the top to the bottom of the peninsula. This narrow peninsula reminded me of North Carolina’s Outer Banks, where often when driving you can look one way to see the ocean and the other way to see the bay. Of course, Long Beach is not an island, so we did not have to worry about ferries. We spent too little time on this peninsula and I have added another visit there to my list of things to do. 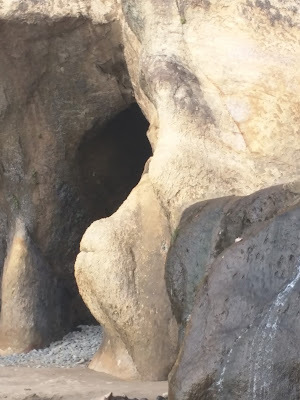 See https://funbeach.com/ for news of the attractions of the Long Beach peninsula. After eating lunch in the small city of Long Beach (at the southern end of the peninsula) and walking some of its nicely developed beach-front trails, we continued on Hwy 101 across the soaring bridge that links Washington State with Oregon. Here is where the mighty Columbia River meets up with the Pacific. The bridge took us into Astoria, and after a quick look around the city we continued south on the Oregon Coastal Highway (the state’s name for Hwy 101). In the northern part of the state, Hwy 101 was often within sight of the Ocean. After some time peeking through the trees for a glimpse of the water, we were ready for an encounter with an Oregon beach. On a whim, we turned into a parking area with the sign “Hug Point State Park.” I am glad we did. The Hug Point beach is broad and sandy, surrounded by bluffs into which ocean waves have dug caves. Also, not far from the ocean’s edge, huge rock formations rise out of the water. 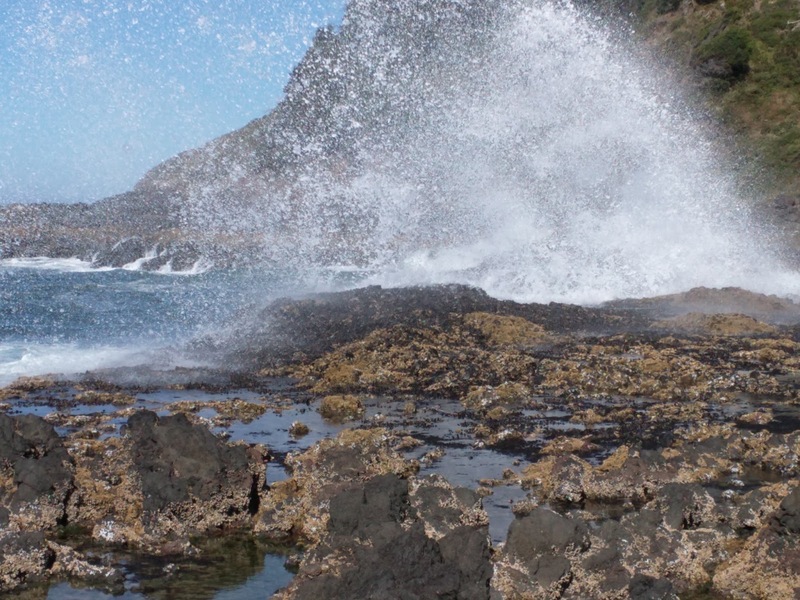 Hug Point State Park is just one of many small beach parks off Hwy 101 in northern Oregon. If the others are like it, this part of the state is particularly blessed with beauty. Continuing south, we had a steady diet of enticing ocean views until we reached the small city of Garibaldi; then the highway went inland a few miles, passing through Tillamook (famous for its cheese). We traveled for quite a while with only periodic glimpses of the Ocean until we reached Lincoln City. There, we got a room across the street from – you guessed it -- a sandy beach. The next day we continued south on the Oregon Coastal Highway and had a long stretch of road with the ocean in view. One of the two highlights of the long day of driving occurred after we passed the city of Depoe Bay, whose front street has businesses facing the Ocean. We noticed a crowd congregated on the sidewalk across from the downtown stores. They were intensely staring out at the ocean. We wondered why they were there (bird watchers? ), but traveled on. Then, climbing a steep hill south of the city, we saw a bevy of cars parked on a high bluff overlooking the ocean. Many people were standing at the bluff’s edge. Were they going to jump? We stopped to investigate. We quickly learned that the attraction was whales. From that vantage point, we could see a couple of whales periodically coming to the surface. Not far from them, two whale watching boats were filled with observers. We enjoyed the spectacle; that was the first time I had seen whales in the Pacific. After Devils Churn we made the long drive to California, stopping intermittently when a view absolutely demanded attention. During the drive, as the road veered inland a bit, we traveled through land famous for its enormous sand dunes. (See information on the Sand Dunes National Park here: http://www.fs.usda.gov/recarea/siuslaw/recreation/recarea/?recid=42465) . Sadly, we had no time to explore the dunes, but noted their existence as candidates for future travel adventures. At the end of a long day of travel, exhausted by viewing a surplus of majestic sights, we crossed the Oregon and California border, then stopped in Crescent City, CA for the night. Crescent City is not a particularly attractive city, so we departed quickly the next morning. We had two key items on our agenda: to explore the Redwood forests and to go down Highway 1 to Mendocino. Not long after we took off, fog rolled in and stayed around – in and near the water -- most of the day. The play of light and shadow on and over the water enhanced the beauty of the setting. We spent the morning appreciating redwood trees whose height and age and beauty are worthy of a long string of admiring adjectives. 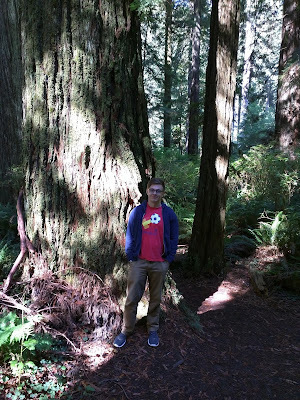 We left Hwy 101 to drive on the Newton Drury Scenic Parkway through the Prairie Creek Redwood State Park. Midway through the Parkway, we stopped to walk a trail among the giant trees. As we sated our interest in redwoods, we worked up a big appetite and stopped in Trinidad, a nifty ocean-front city whose name I had never heard before. With the lingering fog, we had some fetching views of the ocean from the top of the bluff on which the city sits. After a few minutes in the city, I had the thought: “Wow, I would like to live here.” Then I saw a modest house for a sale a few steps from where we parked. The half-million dollar price tag reminded me of why I don’t live in such a place. Continuing down Hwy 101, we saw enough of Humboldt County to regret that we did not have enough time to check out its many attractions. When we entered Mendocino County, Hwy 101 had gone several miles inland and we were ready to get back to the Ocean. To do so, we left Hwy 101 to travel on California’s famous Hwy 1 at its northern entrance. The first segment of his highway, we quickly found out, is a scary, twisting-turning two-lane road through the foothills of the Pacific Coast Mountain Range. The road has innumerable hair pin turns near jutting bluffs and very few straight stretches. It was an exhausting drive that, fortunately, paid off by taking us to the most memorable views of the Pacific to be found anywhere. Along the ocean, Hwy 1 is still a dangerous road. Built in the 1930s, it is narrow by modern standards with almost continuous zigs and zags as it follows the coastline. What makes it especially dangerous are the ocean vistas that distract drivers as they try to negotiate the meandering road. Driving along the Northern California coast, I was getting excited about the prospect of visiting Mendocino. For some reason, I have long wished to see this small coastal town. I am not sure why – maybe because of something I read or saw three decades ago when living a couple of hours away in the San Francisco Bay area. Whatever the source, I have pictured this town as an ideal ocean-front community. Mendocino did not disappoint. This unincorporated village of about 900 people sits on a bluff with the Pacific clawing at it on three sides. A haven for artists, it is quiet, tidy and unpretentiously upscale. It has an active art center with a gallery and small theater. At the village’s western edge is an ocean-side state park overlooking the ocean with trails for hiking and enticing views to the north, south, and west. 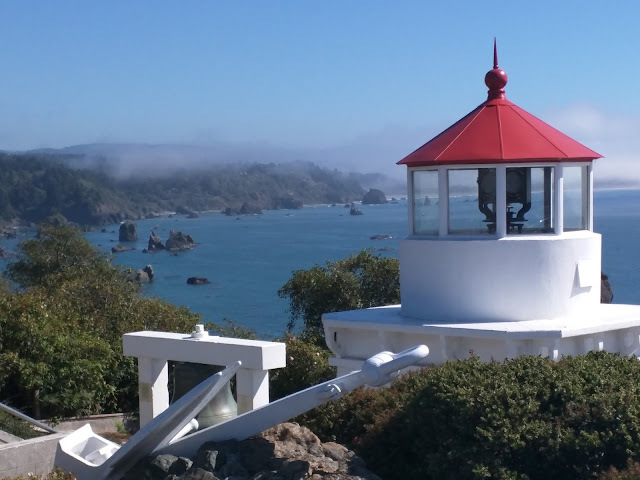 In the evening, a lighthouse on a large rock to the north whirls its illumination across the water toward Mendocino every three or four seconds. The night in Mendocino, in a pleasant inn, was the last on the coast. We departed the next morning for a 150-mile trip to Berkeley, but just a few minutes after leaving the village and before we turned inland to drive through Mendocino County’s wine country, we noticed a huge modern mansion sitting by itself on the edge of a high bluff above the Pacific. On this perfectly beautiful sun-filled day, the house struck me as the perfect house in a perfect location, and my envy rose to new heights. After a few minutes of stewing in my envy, I calmed down, reminding myself that I had just spent four days enjoying some of the most spectacular ocean views in the world. I decided to be thankful for what I have instead of envying the rich SOBs with their billion dollar mansions and their perfect lives. Well, maybe I didn’t get rid of all traces of envy, but as we left the coast, I was happy that I had been able to make this trip and was looking forward to returning. A good thing about this embarrassment of riches is that I can easily go back for more.